Germany may be launching a new era of city-scale energy storage. But there are still many incremental steps on the way. A German gas storage firm is planning a battery big enough to power a city the size of Berlin for an hour, using redox flow technology. 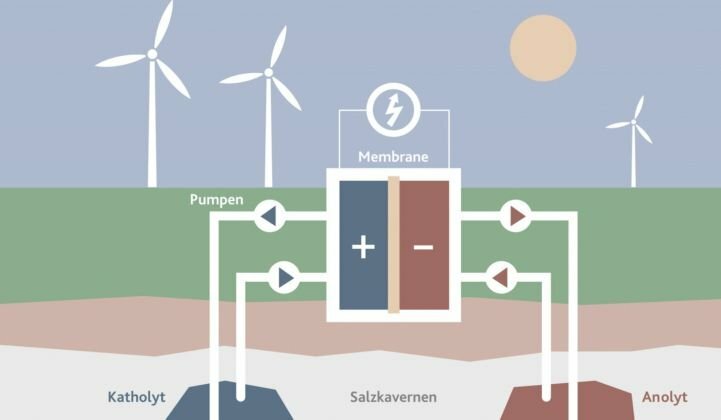 The planned project, which Oldenburg-based EWE Gasspeicher is billing as the world’s largest battery, will involve filling two salt caverns, each of around 100,000 cubic meters in volume, with brine to create a redox flow battery that has capacity of up to 120 megawatts and 700 megawatt-hours. EWE Gasspeicher currently uses caverns for natural-gas storage and is looking to bring the novel redox flow technology, called brine4power or b4p, to market by 2023. The project will be based on an experimental process, developed at the Friedrich Schiller University in Jena, Thuringia, which employs electrolytes based on recyclable polymers dissolved in salt water. This could make the technology more environmentally friendly than some other redox flow chemistries, such as those that rely on vanadium dissolved in sulfuric acid. However, “We need to carry out some more tests and clarify several issues before we can use the storage principle indicated by the University of Jena in underground caverns,” noted Ralf Riekenberg, head of the brine4power project, in a press release. The tests will include an initial pilot with a capacity of up to 20 kilowatts and 40 kilowatt-hours, using plastic containers sited aboveground at EWE Gasspeicher’s gas storage facility in Jemgum, East Frisia. The pilot would be “probably in the fourth quarter of this year,” the company said. If successful, EWE is planning a second aboveground prototype of up to 500 kilowatts and 2.5 megawatt-hours. An eventual 700 megawatt-hour plant could remain fully charged for several months, and it could pave the way for even larger projects. “The maximum storage capacity…is limited only by the size of the storage containers for the electrolyte liquids,” according to EWE Gasspeicher’s website. The gas company, a subsidiary of Germany utility EWE, expects the cost of b4p storage to be comparable to pumped hydro storage. Brett Simon, energy storage analyst at GTM Research, commented: “My gut reaction is that this project is aiming for a lofty but important goal: storing energy to supply a whole city. “Such goals will become increasingly important, particularly for a market like Germany that has aggressive renewable energy goals under the Energiewende and thus is deploying increasing amounts of intermittent generation while simultaneously retiring baseload plants," said Simon. More generally, the EWE Gasspeicher comes amid growing interest in the role that long-duration, large-scale storage might play in helping energy systems operate at 80 percent to 100 percent intermittent renewable generation. A number of territories, including most recently Hawaii, are now aiming for 100 percent renewable energy. But Stanford Professor Mark Jacobson, whose studies suggest such targets are achievable, has recently come under fire from other academics. The debate highlights the fact that any 100 percent renewable target would require significant increases in storage capacity. Pumped hydro might be able to provide the volume needed, but the technology suffers from high capital costs and permitting problems. Meanwhile, researchers are working on a raft of alternative long-duration mass-storage technologies, ranging from compressed-air energy storage to stored energy in the sea. Flow batteries remain a promising bet in this direction. One player, ViZn Energy Systems, recently claimed it could undercut the price of a historically low solar-plus-lithium-ion-battery power-purchase agreement by around 20 percent. ViZn’s price promise was based on a 30-megawatt, 4-hour storage capacity. In theory, the technology is well suited to deliver large volumes of power over several hours or even days. Until now, though, no flow battery project has been scaled up to serve an entire city. That’s why GTM Research's Simon says he “will be interested to see more details on this project when released."